Shopzilla revamps "Smart Pricing" with "Single Rate Smart Pricing"
Shopzilla announced today that beginning on June 18, they will implement a change to their “Smart Pricing” rates that were put in place about a year ago. The “Smart Pricing” model put in place last year was developed to make the CPC rates vary based on the success of each product. While “Smart Pricing” decreased some stores’ average CPC, and improved quality of the products and merchants being displayed, there has been one drawback for the larger retailers and agencies that run the feeds. A simple way to control the bidding. The issue at hand according to Shopzilla, is the range of rates across so many categories, made it very difficult to make bidding changes because all of the rates were so varied. Shopzilla’s solution, make all the rates the same! The question and fear most people will initially see is the $4.00 rate. Just like the “Smart Pricing” that has been put in place, the new “Single Rate Smart Pricing” will continue to look at the number of conversions, clicks and traffic and create a CPC rate based on that data. The announcement focuses on the fact that the actual CPCs will be a fraction of the $4.00 minimum bid. 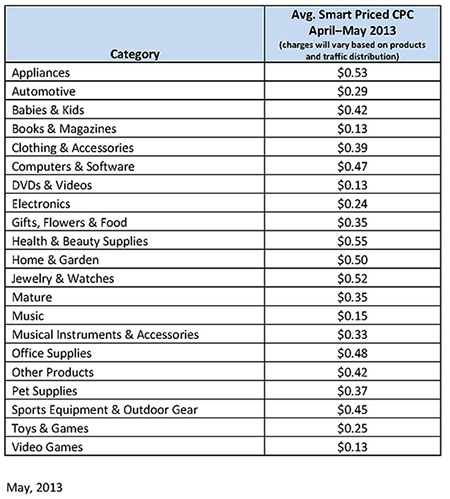 Shopzilla states that CPCs will stay in line with average rates as presented in this table from April -May of this year. A little over a year ago, we launched our Smart Pricing program in an effort to send you the right traffic at the right price. Based on your feedback we believe we hit the mark, but we’ve also heard we can make some improvements to simplify bidding. All products with active bids will automatically be adjusted to the new minimum rate on June 18, 2013. If you are currently bidding above the minimum you will need to adjust your bids to maintain your current rank in search results. These bids will be proportionately smart priced. Please contact us for assistance changing your bids or if you’d like us to adjust bids on your behalf. As always, Shopzilla remains committed to working with each account very closely to ensure performance is in line with your expectations and goals. We are here to help so please let me know if you have any questions or concerns. If you need more information or have questions about “Single Rate Smart Pricing” and how it may affect your Shopzilla account, please call us at 1-888-277-5429 or fill out our contact form. We would love to hear what you think about this new pricing model put in place by Shopzilla. Please leave your comments below. We just received this same email from Shopzilla and I panicked. I came across your explanation and it makes more sense. However, due to the fact that we work on such tight margins, I am very concerned that my average cpc rates will sky-rocket and I will have to pull my products from Shopzilla. Do you think this will happen? Your reaction is normal, as we have received a number of clients calling us in panic today. OperationROI was made aware of these changes last week and have spoken with a Senior Account Representative at Shopzilla in great length. You really shouldn’t see much change if you have been with Shopzilla over the past year. Since Smart Pricing was put in place about a year ago and we have seen many of our clients CPC rates decrease. While anything can happen, we believe that this change should have little affect on your overall ROI. You may find that certain products, which have very good conversion rates, increase some, but you should also see a drop on your lower-performing products CPC as well. Best thing to do is make sure you have the Shopzilla conversion tracking properly implemented so that you can monitor your campaigns ROI down to the product level.